The Grange Country House Bed & BreakfastThe Grange Country House is set in its own beautiful grounds overlooking Keswick-on-Derwentwater and the surrounding fells. An elegant Lakeland house built in the 1840s The Grange is beautifully situated to enjoy the afternoon sun and wonderful views of Catbells and Causey Pike. The Grange Country House is set in its own grounds overlooking Keswick-on-Derwentwater Catbells and Causey Pike. An elegant Lakeland house built in the 1840s The Grange is beautifully sited to enjoy the spectacular views. The Grange Country House sometimes limits bookings to 3 or more days. Room 7 is a large bedroom with a super-king size bed. It is on the second floor. It has good views towards Catbells, although the window in this room is quite small. The bathroom is large, light and airy with a bath, toilet and hand-held mixer shower. We only use superb quality bedding and toiletries, provide Fairtrade tea and coffee, plus complimentary mineral water in every room. Flat-screen TV with digital channels, direct-dial telephone, Wi-Fi internet service and a hairdryer are provided for your convenience. Executive Rm 7 sometimes limits bookings to 3 or more days. 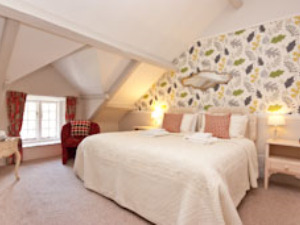 Room 9 is a standard double room situated on the second floor with exposed beams and a sloped ceiling on one side of the room. It is very pretty but is not suitable for the very tall! The room provides comfortable accommodation with a super view over towards Catbell and Causey Pike, some of Lakelands best loved fells. There is a 4'6' bed, and the en suite facilities comprise an eatra large electric shower unit plus toilet and hand basin. We only use superb quality bedding and toiletries, Fairtrade tea and coffee facilities, plus complementary mineral water in every room. Falt-screen TV with digital channels, Direct-dial telephone, wifi internet access and hairdryers are provided for your convenience. Standard Rm 9 sometimes limits bookings to 3 or more days. Leave M6 at jct 40 and take the A66 into Keswick, then left on A591 towards Windermere for 0.5 miles. Take 1st road on right and house is 200 metres on right. The staff are really friendly and helpful, the room and rest of the hotel was really clean and there is use of eco friendly features which is always nice to see. The breackfast has a nice menu with some vegetarian options too. The best part is the hotel is only a short walk from the town center.